Kerry calls deal 'an opportunity, not a certainty,' says in next stage 'our eyes are wide open,' UN's Ban urges peace deal. The United States gave full backing Tuesday to the announcement of a long-term ceasefire between Israel and the terror group Hamas, a truce that roughly half of the Israeli Security Cabinet opposed, but was not given a chance to vote on. 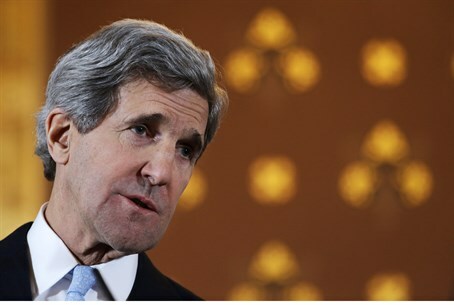 US Secretary of State John Kerry called the deal "an opportunity, not a certainty," even while stating his "strong support" for the agreement. "We are approaching the next phase with our eyes wide open. We have been down this road before and we are all aware of the challenges ahead. Today’s agreement comes after many hours and days of intensive discussions about how a sustainable ceasefire might provide the space and the opportunity to address long-term issues," said Kerry. Kerry also said "certain bedrock outcomes" will need to be incorporated in any long-term arrangement, including a cessation of terror tunnels and rocket attacks on Israel. US State Department spokesperson Jen Psaki said earlier "we strongly support the cease fire announcement." However, she added that Kerry has no plans to restart the peace process anytime soon, after his last attempt failed in April as the PA signed a unity deal with Hamas. UN Secretary General Ban Ki-Moon also remarked on the ceasefire on Tuesday, saying he hoped it would be a prelude to a final peace deal. The UN is ready to support efforts to deal with the "structural factors of conflict" between Israel and Gaza, the UN spokesman said according to AFP. The ceasefire went into effect at 7 p.m. Israeli time. Gaza terrorists launched a fierce barrage of rocket and mortar fire from an hour before the ceasefire until 15 minutes after it, killing an Israeli and seriously wounding two others in the process. While the Palestinian Authority (PA), Hamas and Islamic Jihad delegation called the ceasefire a "permanent" truce, a senior Israeli official described it as "unconditional and unlimited in time." The US, which recognizes Hamas as a terrorist organization and itself has a policy not to negotiate with terrorists, has taken an aggressive stance against Israel in Operation Protective Edge, now in its 50th day. US President Barack Obama late last month, in the middle of the fighting, blocked a routine shipment of Hellfire missiles to Israel and ordered greater scrutiny on all future Israeli arms requests. Obama has been at odds with Israel over the defensive operation in Gaza, making various attempts to press Israel into accepting a truce. After a ceasefire went into effect two weeks ago, only to be breached by Hamas last Tuesday, Obama called Prime Minister Binyamin Netanyahu to push for a "sustainable" ceasefire. According to US officials, that phone call between Obama and Netanyahu was "particularly combative." While Netanyahu may have received great pressure from Obama, his apparently unpopular decision to concede to a ceasefire with Hamas comes as his approval ratings in Israel are plummeting over what is perceived as his inability to take decisive action and restore security to Israel. A survey for Channel 2 found on Monday that in just four days Netanyahu's approval rating dropped from 55% to 38%; at the time of the IDF ground entry to Gaza earlier in the operation, that rating was as high as 82%. Ironically, Obama told the New York Times earlier this month in an interview that Netanyahu had too much public support, and that he needed internal pressure - not to defend Israel, but rather to make land concessions to the PA.